FINALLY! Finally I can share this recipe with you! My selfless test baking and tasting of chocolate has paid off. You know what I mean. It’s really hard. That’s how selfless I am. Only to find the PERFECT recipe for you. 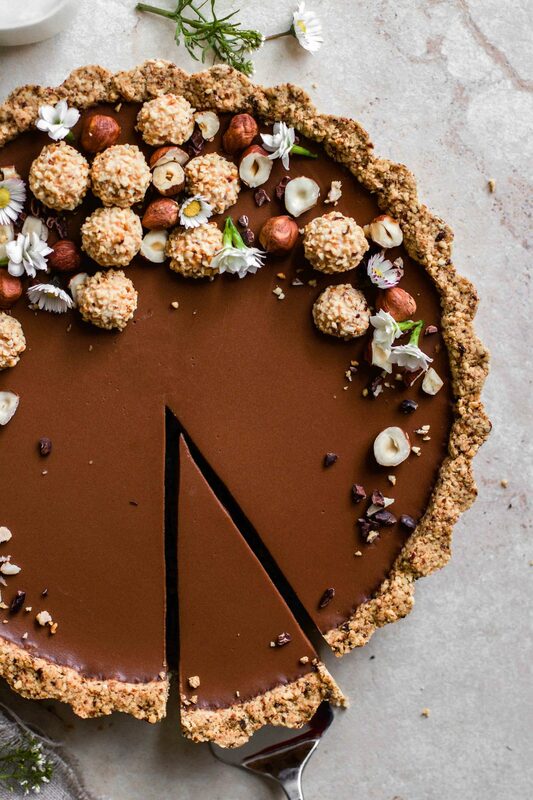 The result is this incredibly delicious chocolate tart. A dessert like a fairy tale. Why? Dates and maple syrup, means no refined sugar. Oatmeal (gluten-free if you like) and nuts, means no flour. Coconut milk and coconut oil, means no unhealthy fats. I used a chocolate with 70% cocoa. Since I have a weakness for dark, bitter chocolate, the combination of sweet crispy base and a bitter-ish chocolate cream is ingenious. If you want it a little sweeter, add 1-2 tablespoons more maple syrup or use half a dark chocolate and the half a milk chocolate. I baked the crust. Theoretically, you could take the ingredients one to one for a raw cake (just use a little less coconut oil). BUT (!) the crunch is missing if you don’t bake it. For me, the ratio of the soft, melting cream to the crunchy base is a decisive reason why this tart is one of my absolute favourite desserts. Which brings us to the cream…mmm. The secret why it melts on the tongue is that it does not contain any solid ingredients such as nuts or cashews. Instead, I found the perfect ratio of coconut milk, chocolate, agar agar, oat milk & Co, which makes the chocolate filling incredibly soft and creamy. Only use the solid part of coconut milk. If you put the can of coconut milk in the fridge for at least an hour, it should have settled on top. That’s about 170 g. The remaining, thin coconut milk is great for porridges. The oat milk is naturally sweet. So you automatically need less maple syrup for sweetening. If you use unsweetened almond milk, you may need to add a little more maple syrup to the cream. Always enjoy the chocolate tart fresh from the fridge. Only when it is really cold does it have the creamy consistency that melts on your tongue. Such a tart is not only a tasty highlight, but also visually a real eye-catcher. Let your creativity run wild and decorate according to your taste. Add 30 minutes baking time and 6-8 hours in the fridge and this Dream of a dessert can be enjoyed. 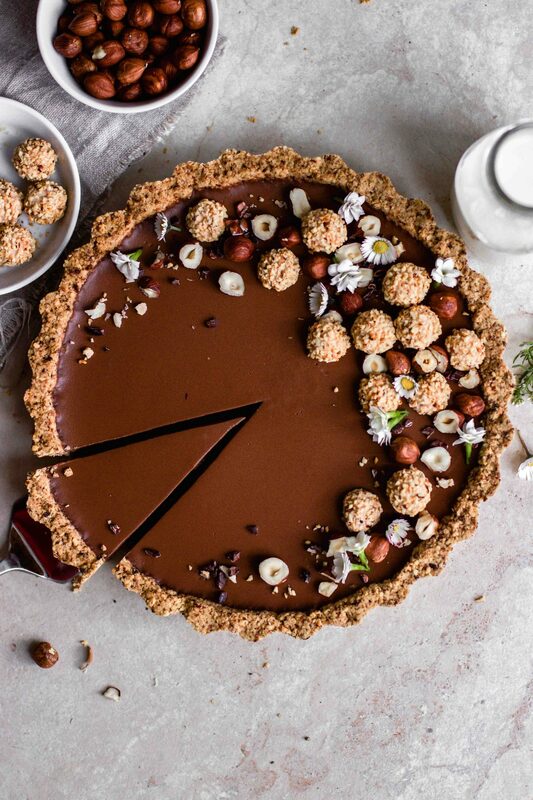 This chocolate tart. It. Is. PERFECT. 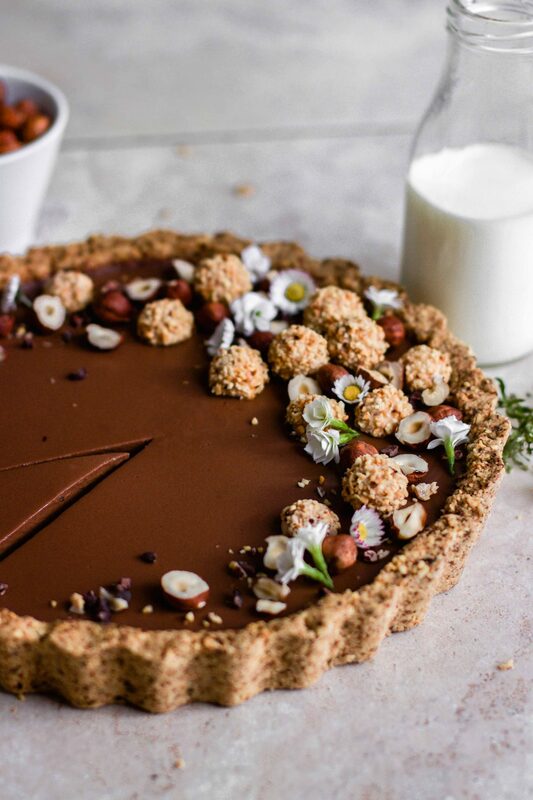 This is the ONLY chocolate tart recipe you will ever need. A crispy walnut base and a melt-in-the-mouth chocolate cream. In addition, it is vegan, gluten-free and without refined sugar! Prepare a tart form (Ø25cm). If it is not coated, spread with some melted coconut oil. Preheat the oven to 170°C / 350°F. For the crust, put half of the grated almonds, oat flakes, dates, salt and maple syrup in a blender and mix for a few seconds until a fine, sandy consistency is obtained. Add the remaining almonds. (As a result, there are still a few "larger" pieces of nuts in the dough that make for a nice bite.) Press the mixture firmly into the tart form, also up the edge. Bake in a preheated oven for 25-30 minutes until golden. Allow to cool completely. For the chocolate filling, put all the ingredients in a pot and mix well. Bring to the boil while stirring constantly. Switch back to medium heat and simmer for 2-3 minutes until the cream thickens slightly. Remove the pan from the heat and let it cool for 30-60 minutes at room temperature. Stir again and again. Empty the cream into the cooled nut crust. Refrigerate for at least 6-8 hours or overnight. 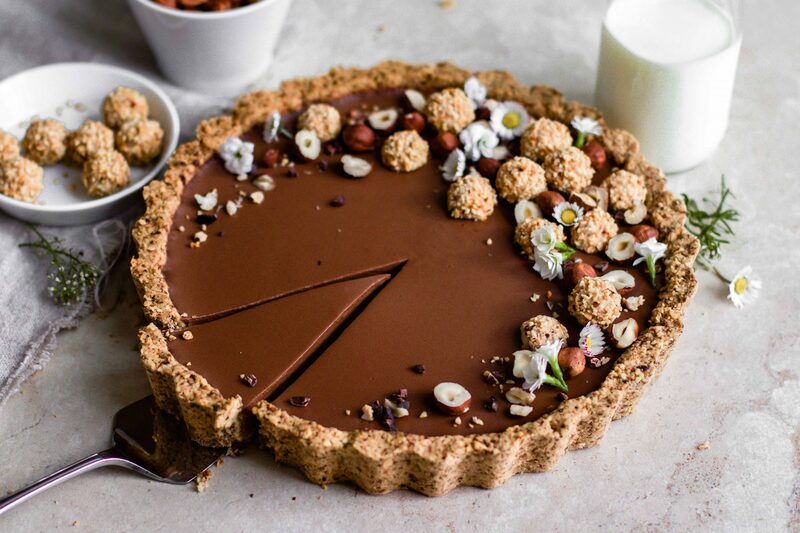 Decorate the chocolate tart as desired and enjoy cold. TIPS: - Use only the solid part of the coconut milk. If you put the can of coconut milk in the refrigerator for at least one hour, the solid part should have settled on top. That's about 170 g. The remaining, thin coconut milk is great for porridges. 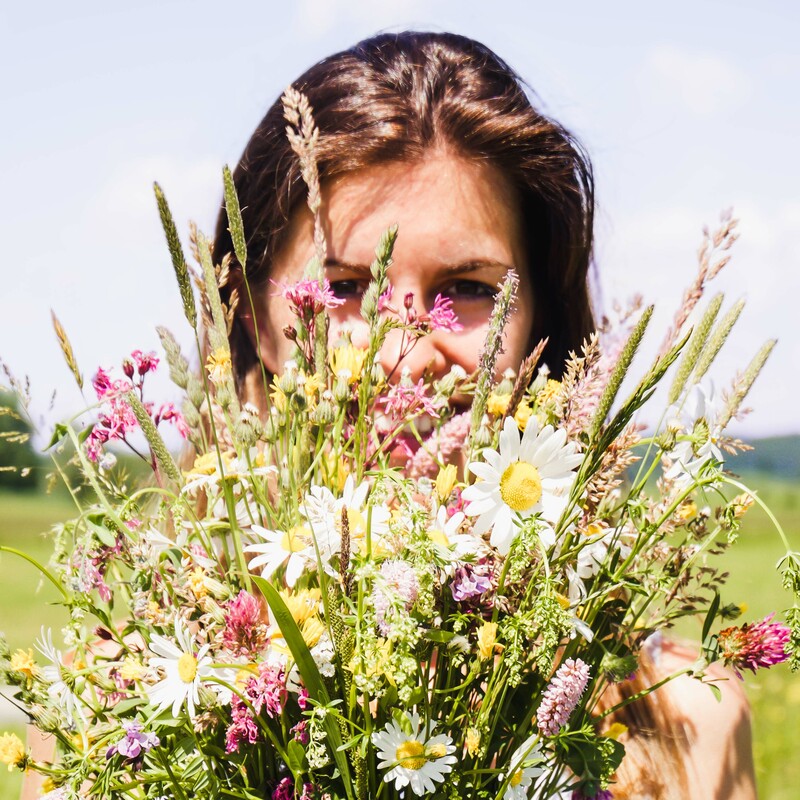 -The oat milk is naturally sweet. So you automatically need less maple syrup for sweetening. If you use unsweetened almond milk, you may need to add a little more maple syrup to the cream. - Always enjoy the chocolate tart fresh from the fridge. Only when it is really cold does it have the creamy consistency that melts on your tongue.